Singapore Studios of Carry On Harry Talk Show invited Filmmaker Kireet Khurana on its talk show to discuss his award winning film released on NetFlix platform world wide this year.The most unique aspact of this film is that it is based on life of prominent filmmaker from bollywood Mr Saeed Mirza. Saeed Akhtar Mirza who himself started his career as a documentary film maker in 1976. Some films like acclaimed Arvind Desai Ki Ajeeb Dastaan (1978), Albert Pinto Ko Gussa Kyoon Aata Hai (1980), Mohan Joshi Hazir Ho! (1984), Salim Langde Pe Mat Ro (1989), he directed and produced popular TV serials Nukkad (Street Corner) (1986) and Intezaar (Wait) (1988), His last film Naseem was released way in 1995. 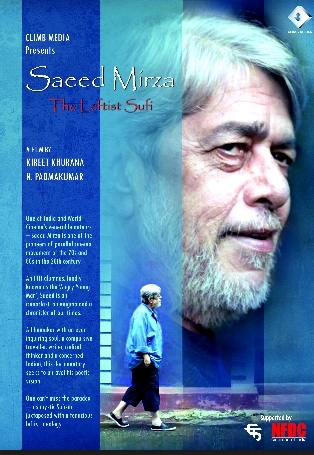 The film SAEED MIRZA – The Leftist Sufi takes us to the journey of this filmmaker revisiting those locations where all his films were made and the changes hence after over the decades. It openly speaks about his beliefs , his journey his expression. awards for his works.He has directed 20 award-winning short films for UNICEF, National Film Board of Canada,Childline etc. He directed “Toonpur Ka Superrhero” India’s 1st live action and 3D animation movie starring Ajay Devgn and Kajol. He has served on the Jury of various festivals like National Film Fest., MIFF, Jagran Fest. etc. Also was discussed his own journey of making films in both commercial and Non Commercial zone and his experiences as a filmmaker.Stay tuined for more about this on the Show Episode with talk show host Harry Johal from Singapore.